God in his love always wills what is best for us. In his wisdom he always knows what is best, and in his sovereignty he has the power to bring it about. As a senior in college, a friend of mine invited me to join his early Sunday morning Bible study. 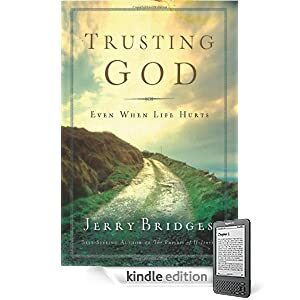 The book: Trusting God by Jerry Bridges. Our assignment each week included reading a chapter of the book, completing the corresponding study guide, and memorizing one statement from that chapter with a key Scripture verse. The quotation above was the first we memorized together, one that we quoted every week. It became one that I would silently rehearse and affirm countless times since. The whole book revolves around those three attributes of God: his sovereignty, wisdom, and love. While Christians affirm and rejoice in these truths (“I sing the mighty power of God; I sing the wisdom that ordained, etc. ; I sing the goodness of the Lord”), we struggle to believe that all three are true when life hurts. Enter Trusting God. Written with humility, compassion, and clarity, Bridges walks believers through key Scriptures that define and apply God’s sovereignty, wisdom, and love. If you wonder what the purpose of suffering is–and if you’re human, you have–then this book is for you. For a limited time this book is free for use on the Kindle or Kindle app. If you don’t own a Kindle, you can download the Kindle app for free (Windows PC | Mac | iPhone/iPod Touch | iPad | more). Thanks Matt for posting this. I have the paperback that is on my must read list. Great to have a e copy as well.